style by UJIFUSA. The SOSHU style hibernated here through SHINTO to provide its gifts to SUISHINSHI MASAHIDE and through him, to the great smiths of the SHIN-SHINTO. 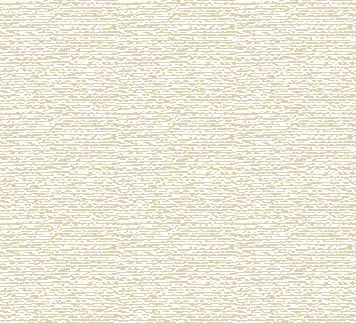 HADA - Fine KO-MOKUME, ITAME, even NASHIJI-like. description of a famed surface condition. CHIKEI IMOZURU "SATSUMA Potato Vines". ARA JI-NIE is a school mark. in NIE and NIOI. ARA-NIE (coarse NIE). the blades are not old. Itame Masame mix with Ji-Nie and Chikei. Notare Gunome with Ko-Gunome-Midare mix with Ashi and Sunagashi with Ara-Nie. Midare-Komi Boshi with Ko-maru and Hakikake. Fukuda Isao Yoshikazu Family Possession. 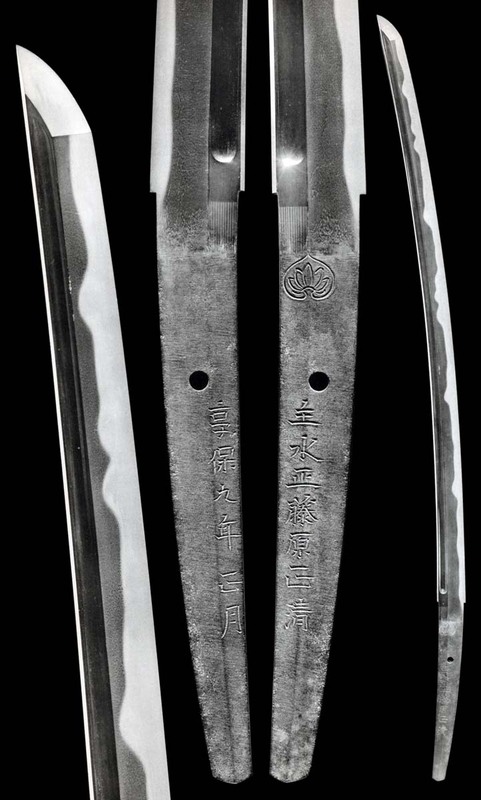 Shinogi-tsukuri, Mitsu-Mune, wide Ji, Shinogi-taka to Chu-Kissaki. Ko-Itame Hada that runs. Has thick Ji-Nie and Chikei. High-mounding Notare has Gunome-Midare with Sunagashi and Kinsuji in Nioi-Fukashi and Nie, where Nie becomes Ara-Nie. Running Ko-Itame Hada with Ji-Nie and Ara Ji-Nie. Ko-Notare with Gunome-Togari Ba. Clear Nioi, Sunagashi and Kinsuji, and Ara-Nie. Running Ko-Itame Hada with Ji-Nie. Chu-Sugu Asaki-Notare of clear Nioi and profuse Nie, becoming Ara-Nie. Sunagashi runs and Kinsuji is seen. Midare-Komi Boshi is Saagari Hakikake. 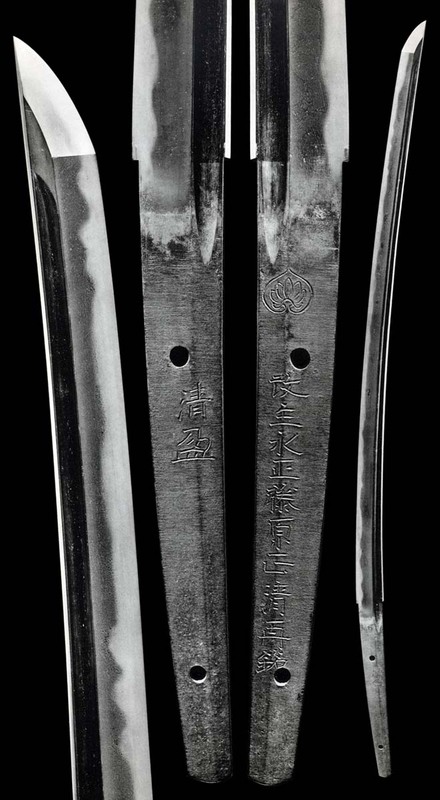 Shinogi-Tsukuri, Ihori-Mune, wide, shallow Sori and Chu-Kissaki. Chu-Suguha is Asaki-Notare with Kinsuji and Ara-Nie. 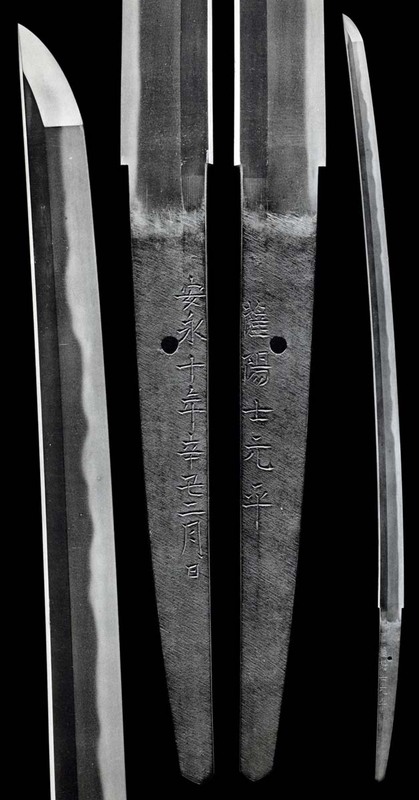 Shinogi-Tsukuri, Ihori-Mune, shallow Sori with Chu-Kissaki. Tight Itame Hada has Ji-Nie and Chikei. Chu-Suguha in a gentle Asaki-Notare where Sunagashi creates Imozuru Potato Vines. 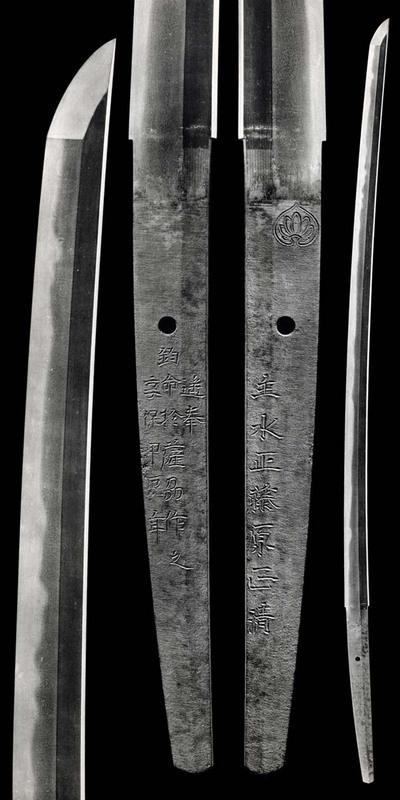 Kinsuji and Ara-Nie. Hira-Tsukuri, Ihori-Mune, sakizori with Chu-Kissaki. Running Ko-Itame Hada with thick Ji-Nie. Chu-Sugu Boshi with Maru Kaeri. 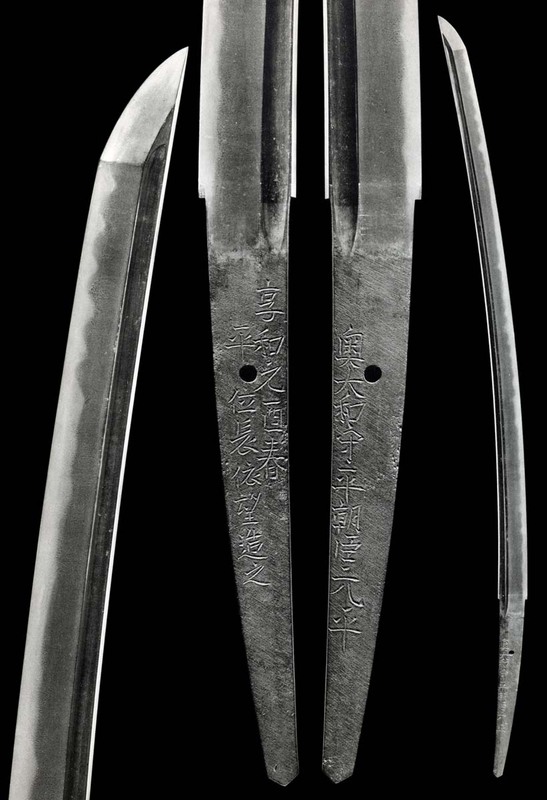 Shinogi-Tsukuri, Ihori-Mune, shallow curve and Chu-Kissaki. Running Itame Hada has O-Hada with Ji-Nie and Chikei. Notare ripples in the upper, becoming Asaki-Notare in the lower. O-Midare of Sunagashi in Nioi and Nie-Deki Fukashi and shows Kinsuji insisting. Midare-Komi Saagari Ko-Maru Boshi with falling Kaeri. Running Itame Hada has O-Hada, Ji-Nie and Chikei. High-reaching O-Notare through the upper, becoming Asaki-Notare in the lower. O-Midare Gunome-Midare with Ashi of Kinsuji and Sunagashi in Nioi-Fukashi and Ara-Nie. Midare-Komi Saagari Ko-Maru Boshi with small Kaeri. 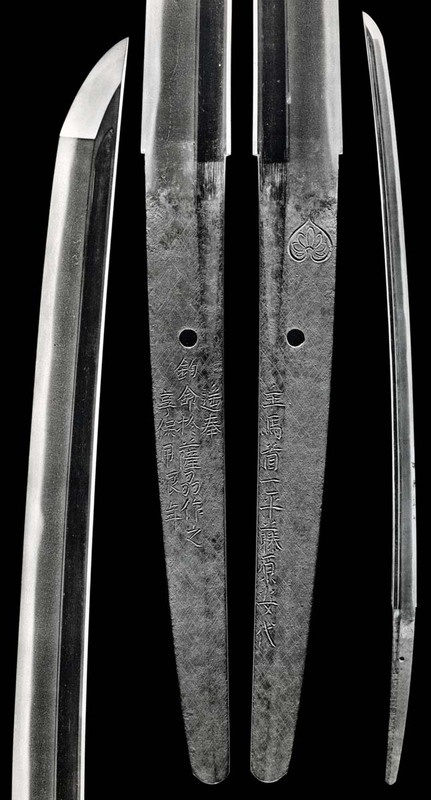 Shinogi-Tsukuri, Ihori-Mune, Shinogi-taka, deeply curved to strong O-Kissaki. Dark Kuro Itame Hada has profuse Ara Ji-Nie and Chikei. 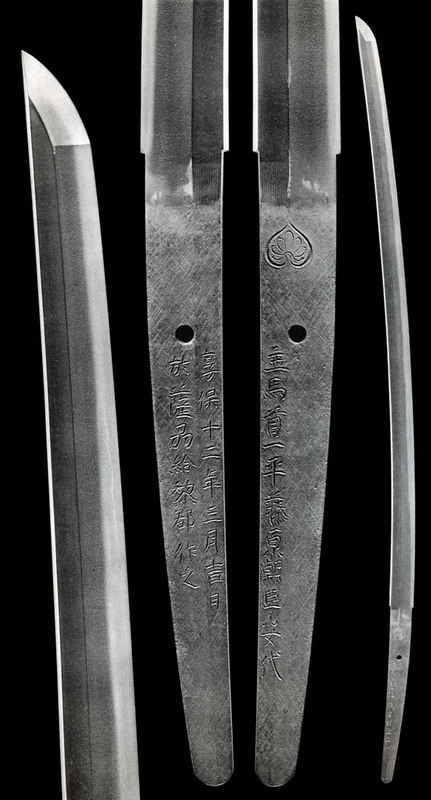 Ko-Notare ripples in the upper, holding Gunome-Midare with Togari. Sunagashi and Kinsuji cut through figures in strong Ara-Nie. Midare-Komi Boshi has Hakikake, Ara-Nie amidst striating Jiba.